Sources: “Life Of Napoleon,” Sir Walter Scott; “Coningsby,” Benjamin Disraeli; “Pawns In The Game,” by British Intelligence Officer WIlliam Guy Carr. JEWS ARE THE BANKERS of the world. Banking has been the livelihood of the Jews for centuries. This is because historical Christendom forbad the employing of usury as forbidden in the Bible. Thus it was the Jews who were the money lenders of Christendom. And usury was charged by the Jews to the Gentiles whom the Jews always looked down upon as sub-human and not worthy of Biblical consideration. THE MODERN AGE OF JEWISH BANKING began with Mayer Amschel Bauer who in 1750 set up the House Of The Red Shield (”House Of Rotschildt”) in Frankfort of the Austria-Hungary Empire in the area called, “Judengasse,” literally “Jew Street.” Mayer Amschel put up a banner on his store front with a Red Shield on it complete with the occult symbol of the so-called Jewish Star of David. When learning that General von Estorfff, for whom Mayer Rothshcild ran errands when employed as a clerk at the Oppenheimer Bank, was a coin collector, and now attached to the court of Prince Wilhelm IX of Hesse-Cassel, Mayer Rothschild saw an opportunity that he coudn’t pass up. By offering valuable coins at discount prices, Mayer Rothschild soon ingratiated himself with the General and soon with Prince Wilhelm IX himself for whom he became the financial court agent. 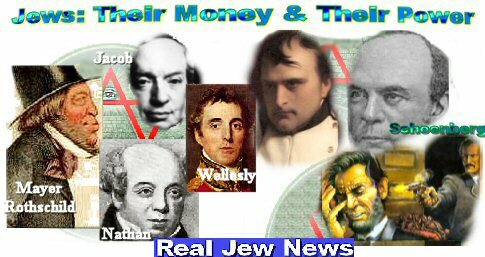 Not long afterwards, Mayer Rothschild sent the ablest of his five Jewish sons, Nathan Rothschild, to establish a bank in London. Mayer Rothschild’s other four Jewish sons, he placed in Frankfort, Paris, Naples, and Vienna. Developing circumstances allowed the Rothschilds to formulate a plan which would guarantee them the financial control of Europe, and eventually the world. It began with Napoleon’s military campaigns which proved to be a boon to the Rothschild’s banking empire in many ways. Continental Europe being under siege, London became the financial capital of the world with Nathan Rothschild growing in prominence. His brother Jacob Rothschild, adopting the more elegant first name of “James” was stationed in Paris, where he undermined Napoleon’s empire, effectively channeling needed funds to the Duke of Wellington helping him in his campaigns against Napoleon. Then the Rothschild’s saw another opportunity which they seized upon in their under-handed way. This was by taking advantage of the outcome of the Battle of Waterloo waged between the 1st Duke of Wellington, Arthur Wellesly and Napoleon. Early in the battle, Napoleon appeared to be winning, and the first military report to London communicated that fact. But the tide turned in favor of Wellington. On Sunday, June 18, 1815, a courier of Nathan Rothschild named Rothworth brought the news to Nathan Rothschild in London on June 20. This was 24 hours before Wellington’s courier arrived in London with the news of Wellingon’s victory. Seeing this fortuitous event, Nathan Rothschild began spreading the rumor of a British defeat. With everyone believing that Wellington was defeated, Nathan Rothschild began to sell all of his stock on the English Stock Market. Everyone panicked and also began selling, causing stocks to plummet to practically nothing. At the last minute, Nathan Rothschild began buying up the stocks at rock-bottom prices. This gave the Rothschild family complete control of the British economy, and forced England to set up the Central Bank of England, which Nathan Rothschild controlled. Following the French securing massive loans in 1817 in order to help rebuild after their disastrous defeat at Waterloo, the Rothschilds saw their chance to get a firm grip on the French economy. Rothschild agents began buying huge amounts of French government bonds, which caused their value to increase. On November 5th, they were dumped on the open market, creating a financial panic as their value declined. Thus the Rothschilds gained control of France since the government bonds, being practically worthless, the House of Rothschild became the prime lender to the French government - “with interest” accruing daily. These were the beginnings of the House of Rothschild, which controlled a fortune estimated to be well over $300,000,000. Soon the Rothschilds spanned Europe with railroads, invested in coal and ironworks, financed England’s purchase of the Suez Canal, paid for oil exploration in Russia and the Sahara Desert, supported Cecil Rhodes’ diamond operations, aided France in creating an empire in Africa, financed the Hapsburg monarchs, and saved the Vatican from bankruptcy. BACKED BY ROTHSCHILD MONEY, the British declared war on the United States. The Rothschilds’ plan was to cause the United States to build up such a debt in fighting this war that they would have to surrender to the Rothschilds and allow the charter for the Rothschild owned First Bank of the United States, (which in effect was America’s central bank), to be renewed. Thus the Rothschild’s financial control of America was secured. ON JANUARY 30 1835, AN ASSASSIN tried to shoot President Jackson, but miraculously both of the assassin’s pistols misfired. President Jackson would later claim that he knew the Rothschilds were responsible for the attempted assassination. The assassin, Richard Lawrence, who was found not guilty by reason of insanity, later bragged that powerful people in Europe had hired him and promised to protect him if he were caught. In the aftermath of President Andrew Jackson’s actions against the Rothschilds, a Prussian Jew by the name of August Belmont, (the son of Simon SchÃ¶nberg), was sent by James Rothschild II to establish a bank in New York City with the intention to represent the House of Rothschild in America now that their “central bank” was weakened. Belmont, that is, “SchÃ¶nberg,” later started the Interborough Rapid Transit Company, the forerunner of the New York City Subway System. By 1861, the August Belmont Banking family along with the House of Rothschild were heavily involved in financing both sides in the Civil War. Lincoln put a damper on their activities when, in 1863, he refused to pay the exorbitant rates of interest demanded by the Belmonts and Rothschilds and issued constitutionally-authorized, interest-free United States notes. Just five days after General Robert E. Lee surrendered to Grant, Lincoln was shot down in cold-blood by John Wilkes Booth on April 14, 1865. Booth’s grand-daughter, Izola Forrester, states in her book, This One Mad Act, that Booth had been in close contact with mysterious Europeans prior to the slaying and had made at least one trip to Europe. WHAT CAN BE DONE TO BREAK THE WORLD-WIDE JEWISH FINANCIAL POWER? 1. Western Civilization must become “Christian” again. 2. Every person in America and Europe must make a commitment to Christ and regular Church attendance. 3. Christians must tell the Jews that they too must become Christians if they wish to avoid God’s wrath and eternity in hell. Woodrow Wilson, whose signature in 1913 ratified the Federal Reserve Act, said, I am a most unhappy man. Unwittingly, I have ruined my country. America wake up! America has degenerated needlessly and tragically into a land of poverty and misery for millions of citizens. I would like to know if the serial killer in 1888 was a Jew? Perhaps the message that he sent — “The juwes are the men that won’t be blamed?” — And I wouldn’t be surprised if it was a Jew that was behind it!…Since Mr. Rothschild made his mark in England. Do you know anything of the CBI in Iraq, and when the Iraq dinar will reevaluate? From another one who had been brought up in Jewry and hating it since day 1. Christ is here and he loves us. I hope that the Jews would finally wake up. There’s no other news and problems but Jewish.